The Strathmore Woollen Company offers the trade a wide range of tartan accessories which can be made to order in any of our T7 Quality tartans. Made from 100% Pure New Worsted Wool, our Scarf is hand cut and sewn. Each one is centered on the tartan and is perfectly matched. The tight twill weave produces a tartan of extraordinary clarity which makes a colourful accessory to any outfit. Ideal as a gift or a souvenir, whether wearing clan colours or simply accessorising, the Scarf is suitable for any occasion. Full serape 180 x 150 cms (71” x 59”) Short serape 150 x 150 cms (59” x 59”)Made from 100% Pure New Worsted Wool, this fashionable wrap combines elegance and warmth. Colourful and comfortable, the Serape is available in two sizes and makes an ideal garment for any occasion, whether in clan colours or simply in a tartan design to match an outfit. Made from 100% Pure New Worsted Wool, the Tonag is our Scottish Poncho, a highly fashionable accessory for all occasions. Available in any of our T7 tartans, the smaller Tonag Beag compliments any outfit with a dash of colour, while the larger Tonag Mhor provides luxury and warmth on a cold winter’s day. Available as a single item with a join in the middle. 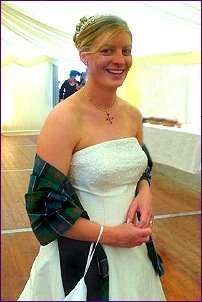 Un-joined sashes in multiples of 4 per tartan, in any T7 Quality Tartan. 6. SM/A/513/A Adult Tammy, available to order as a single item. 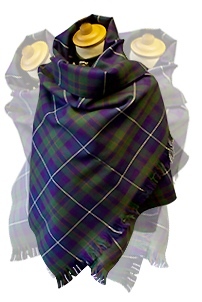 Also available as a child’s tammy under code SM/A/513/B with a minimum order of 12 per tartan. Made from 100% Pure New Worsted Wool, this fashionable Pashmina combines elegance and warmth. Colourful and comfortable, the Pashmina is an ideal garment for any occasion, whether in clan colours or simply in a tartan design to match an outfit. Made to Order in over 300 tartans. Please use the Contact Us form to enquire about the current range.